Wonderful Small Corner Cabinet in figural Cherry . . . The highly figured birdseye door is framed in Black Walnut which gives a nice contrast to the Cherry and the whole has a wonderfully alligatored surface with great texture. 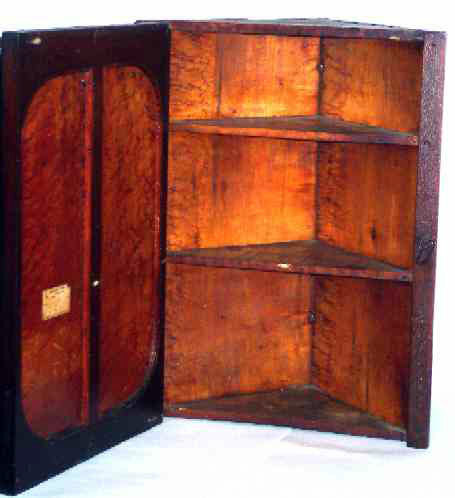 The interior has two shelves and the little cabinet is in excellent condition . . . very nice and clean. When one looks at the cabinet the color on the door is such that one might think that it has been painted with a pumpkin colored paint but it is not. There is the remnant of an old label that indicates that at one time the cabinet was used in a Pharmacy in Rutland, Vermont. Nice small size . 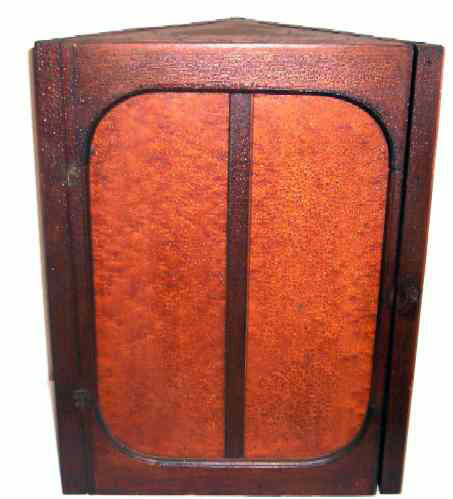 . . 20" high x 15" wide and 8" deep and circa 2nd half of the 19th Century.